“I RECKON I’d have quite a bizarre autobiography,” Josh Navidi says. Even if all you cared about was who played Tests, you’d appreciate Navidi’s journey. In 2013, when swathes of Welsh players were in Australia with the Lions, the Cardiff Blue was earning his first cap in Japan. You may recall that Wales lost, and Navidi relives a few other sore details – he broke his nose and was knocked out. Despite sterling service for the Blues, he had to wait four more years to pick up his second Wales cap, when another Lions tour took place. At the time he cracked mates up with the line: “Every four years it’s my year!” But then he was back in red again in November, getting his first game at the Principality Stadium. He’s playing in a Six Nations now, too. That’s the easy bit to recap, though. Talking to Navidi about every other avenue he’s wandered down in his 27 years is a bit like grabbing a greased-up snake. We wriggle off into unexpected corners, much of it good fun. Navidi revels in talking about the impact his father, Hedy, had on him. Dad moved to Wales from Iran aged 18, pushed by his own father to get a good education, and studied civil engineering in Bangor. He then met Josh’s mum, Euros. Hedy intended to return home, but when his father passed away and he had the affections of the young Anglesey lass, that was it, bye-bye Iran. Navidi knows no Farsi, apart from the swearwords, but he can at least follow conversations with mum in Welsh. Older brother Sam inexplicably picked up some Farsi on a visit to Turkey a few years back, much to Hedy’s surprise, but Iran is a world of mysteries really. Navidi likes to travel. He’s done the lads’ trips, to Dubai and San Diego with team-mates. The latter was after Wales’ 2017 summer tour. He and a gaggle of Blues saw club-mate Cam Dolan play for USA. Navidi relished the surfing there; he had been surfing a few years before but that time he was road-tripping around France in a VW camper van with his ex. It is the rugby-shaping, two-year sojourn to Canterbury, New Zealand, that may have had the most profound effect on his now-robust game. He was 16 when he left, his father taking him over. The family planned to emigrate Down Under a few years before but it fell through. Young Josh had always wondered what could have been and after he was surprised with a trip to a Q&A with Jonah Lomu in his hometown of Bridgend, the idea of seeing New Zealand solidified. Mind, a lot of that might have been down to Hedy yakking away with big Jonah for almost 40 minutes, the legend telling Navidi Snr that Canterbury was the place to go. They left two days after Josh finished his GCSEs. Having happened on a clash between Christchurch Boys’ High and Christ’s College, with almost 5,000 other spectators at Rugby Park, the pair got talking to coach Matt Sexton, then attached to the Canterbury Rugby Union. On his recommendation, Navidi went to St Bede’s College and over a two-year stretch with them he tasted success and learnt valuable lessons in rugby. But he knew he would be pulled back to Wales permanently, eventually. Navidi shone as St Bede’s tore into New Zealand’s top four sides. Catching others unaware is a bit of a specialty for the versatile back-row. He carries and hits beyond perceived limitations of his frame. He laughs off talk of his engine but he can go and go – demonstrated by him racking up 80 minutes in all but one club game he’s played this term. In the autumn, when he finally got his Test chance on home soil, he stunned many. In this Six Nations, he has belied the early gloom surrounding Wales’ injuries to play his way. Much of that, perhaps, is to do with the fact this is his first championship. He has a winners’ medal from the 2013 campaign, despite being an unused squad member, but he does not dwell on that; he is simply thankful to now get a crack in the tournament. His rugby is going so well that he’s had to take a step back from the family gym, Physique, in Bridgend. It’s a venture his dad took on in 1995 after finding local options lacking, toiling to do the place up and fill it with equipment for £5,000. Josh, a qualified personal trainer, has been heavily involved but is distancing himself from it for now, with his dad taking over more of the day-to-day responsibilities. Navidi says: “Last year I spent a lot of time in the family gym; I was running it. I felt everything was getting too much and it was better for me to concentrate on my rugby than have something on the side that was distracting. He likes what the gym represents, to show how far his family have come. Hedy had dreamed of wrestling at the Olympics and did coach wrestling, but his calling was always elsewhere. He used to deliver tiles and carpets. He used to work in a kebab shop. The Navidi parents opened up a hair salon before moving from Cardiff to Bridgend. Brother Sam now runs two salons in Bridgend. They’ve done a lot – and then there was the gym. So does the Wales back-row have the same entrepreneurial spirit? “With Wales we had one of those ‘life after rugby’ things. It’s like an exam to see what you would be good at. It took about three hours and then they just went, ‘Yeah, you’re going to be an entrepreneur’. “I was looking to open an estate agents a couple of years ago and I’ve been looking into opening a wine bar as well, in Cardiff. They’re on hold at the minute. I’ve done some personal training but I’m too busy in the day. After rugby you want to chill out. If you think that is it for the twists, Navidi then comes into another new subject off the back of this idea. He is, it turns out, nothing if not innovative. “If you’ve got money saved up, you can open anything. The boys do joke about the fact I save my money. I bought a car off my mate and the engine went in it. I changed the engine myself. It’s the first time I’ve done it but I’ve lowered cars, I’ve changed brakes before… I think I learnt from my dad. He laughs about this but lets slip that he may go car shopping that afternoon. He’s done the best he can with the Audi. Much like Wales have done as they power on, despite multiple injuries. Much like the Blues will have to do, led by senior statesman Navidi, next season in the post-Danny Wilson era. The small squad have to prove many wrong. Navidi doesn’t seem to care if an opportunity looks awkward to others, though – it is still an opportunity. He has been making up for lost time in recent Tests and that inherent Navidi nous, that natural ingenuity, has played no small part in him impressing in red. He has offered up some fine national service. 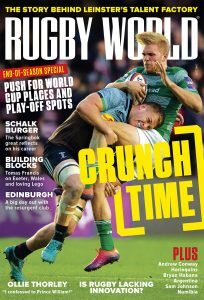 This feature first appeared in the April issue of Rugby World magazine.